Caliente Band, “Viva Sarasota” The First International Latino Festival in the area, with flavors from over 50 countries, including Cuba, Columbia, Mexico, Peru, Venezuela, Dominican Republic and many more, with two great entertainment stages with music like reggaeton, bachata, salsa and Zumba don’t miss it May 2nd Downtown Sarasota 12noon till 10pm with non stop music, food, kids carnival and more!!! It’s all about the food, the music and the Caribbean feel that puts a smile on your face. “Viva Sarasota” The First International Latino Festival in the area, with flavors from over 50 countries, including Cuba, Columbia, Mexico, Peru, Venezuela, Dominican Republic and many more, with two great entertainment stages with music like reggaeton, bachata, salsa and Zumba don’t miss it May 2nd Downtown Sarasota 12noon till 10pm with non stop music, food, kids carnival and more!!! “Viva Sarasota” The First International Latino Festival is a full day, family-oriented festival that celebrates the sights and sounds of the Latin culture on Main Street in Downtown Sarasota May 2, 2015 from 12pm – 10pm. 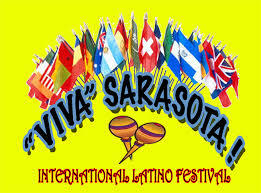 “Viva Sarasota” displays the key ingredients of first rate International artists of Latino music, authentic cuisine, arts and crafts vendors from over 50 different countries, a children’s carnaval and dance presentations including zumba, salsa, flamenco, bomba, mambo and mucho mas. Live performances on two electrifying main stages with the best international artists will shake the Latin American audience with high energy DJ’s and bands that move the crowd featuring salsa, meringue, bachata, cumbia, reggaeton, mariachi, dancers in colorful costumes from their native lands, bomba, and salsa dancing. We invite you to join us at “Viva Sarasota” with expected attendance of 10,000 of our Latin American community that will love the culture and music at Sarasota’s First Ever International Latino Festival. At “Viva Sarasota” you will come enjoy the music, food and art that will make this festival Sarasota’s cultural signature event. “Viva Sarasota” is a family street festival that is catering to Latino families. It’s all about the food, the music and the Caribbean feel that puts a smile on your face. Location: Downtown Sarasota, Main Street. The best Live Bands Florida has to offer from soloist to 12 piece orchestras Salsa Bands, AmericanPop, Blues, Mariachi, Country, Caribbean, Tribute Bands, Cover Bands, Wedding Bands and many more specialty musicians can bring your event to life! Spotlight Events can provide performers that can juggle, stilt walk, unicycle or a performer that can entertain by doing 2 at the same time. Their attire can be themed to match your event. Spotlight Events Entertainments Inc. can provide you with amazing talent for any Occasion or Event. A growing number of fortune 500 companies, small business and unique venues, have one thing in common: they count on Spotlight Events Entertainments Inc. event management for all of their Event Management needs. With over 25 years combined experience in managing all aspect of an event, from planning to production, Spotlight is your one reliable source for all of your event management needs. The team at Spotlight Events Entertainment Inc. is unique and innovative in customizing every event to exceed your expectations. Whether you are planning an upcoming corporate team building exercise, hospitality program, special event, holiday party, casino night, red carpet event, concert, Festival, Circus, gala fundraiser, or any other type of event large or small, we can provide any and all aspects. Spotlight’s personal network of only the finest vendors, venue spaces, industry partners and innovative minds create events unparalleled by any other event planning organization. As a full service event management and destination management company, Spotlight Events is committed to providing their clients with excellence in design and presentation coupled with premier service, management and attention to detail! Welcome to Spotlight Events Entertainments Inc. Your premier event planning & destination management solution for all of your event needs! Spotlight Events international award winning magicians can perform close-up-strolling magic, wonderful children’s shows, mystifying adult illusions, and specialty themed shows that will leave your guests wondering – how did they do that? Remember “FIELD DAY” in elementary school? Our gamemasters bring it all to you Carnival Rides and Games, Potato sack races, three-legged races, shoe scramble, water balloon toss and the famous “Tug-a-war.”- Just to name a few. Do you like games with music- musical chairs, hoola hoops, limbo and more. These will keep everyone on their feet. Caricatures are a great form of entertainment as well as an excellent memento your guests can take home with them. They can draw full faces to full bodies in black & white or color. Generally they can get 15-18 drawings done per hour, so don’t forget this perfect party favor for your next event! !